Although its capital is notorious among stoners and college kids for marijuana hazefilled "coffee shops," Holland has never actually legalized cannabis  the Dutch simply don't enforce their laws against the shops. The correct answer is Portugal, which in 2001 became the first European country to officially abolish all criminal penalties for personal possession of drugs, including marijuana, cocaine, heroin and methamphetamine. At the recommendation of a national commission charged with addressing Portugal's drug problem, jail time was replaced with the offer of therapy. The argument was that the fear of prison drives addicts underground and that incarceration is more expensive than treatment  so why not give drug addicts health services instead? Under Portugal's new regime, people found guilty of possessing small amounts of drugs are sent to a panel consisting of a psychologist, social worker and legal adviser for appropriate treatment (which may be refused without criminal punishment), instead of jail. Peter Reuter, a professor of criminology and public policy at the University of Maryland, like Kleiman, is skeptical. He conceded in a presentation at the Cato Institute that "it's fair to say that decriminalization in Portugal has met its central goal. Drug use did not rise." 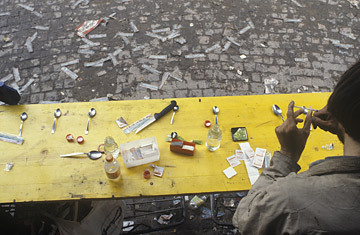 However, he notes that Portugal is a small country and that the cyclical nature of drug epidemics  which tends to occur no matter what policies are in place  may account for the declines in heroin use and deaths. See pictures of Mexico's drug-trafficking industry.